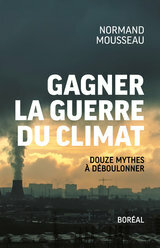 français : Gagner la guerre du climat. Douze mythes à déboulonner. The reduction of greenhouse gases (GHG) will automatically lead to an improvement in our quality of our quality of life. Hydroelectricity is the key to Quebec’s enrichment. It is enough to tax carbon to put a brake on global warming,. The provinces have taken over from the federal government in the reduction of GHGs. These are myths repeatedly repeated by politicians, interest groups, industry spokespersons and the media. These myths give us the impression of mastering the energy transition and comfort us with the illusion that we have the tools to achieve our GHG reduction goals without touching our way of life. Whether in Quebec or in the rest of Canada, governments alternate between ambitious and inaccessible targets, programs that reduce GHG emissions as costly as they are ineffective, or, quite simply, deny the problem. The federal government, after three decades of inaction, is still lagging behind in developing a national policy on the issue. In this essay, I systematically debunk each of these myths and demonstrate that the main barrier to reducing GHG emissions is not so much technological or scientific, but rather political.